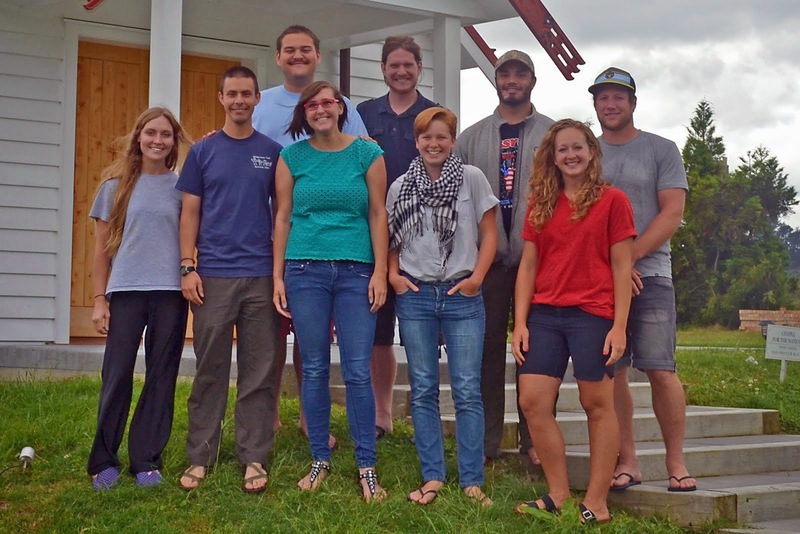 This blog accounts the adventures of 9 YWAM Pilgrimage DTS Members as they journey to the South Island of New Zealand for outreach. Our whole team after climbing to the top of McKellar Saddle! Adventure has filled our hearts this week! A week ago Andrew and Crystal sadly departed our team to start working in Christchurch. As we said good bye to our friends, God was setting us up for a new ministry in the bush. Our team (now seven in company) departed Queenstown and traveled west past Glenorchy. After a bit of windy road around Lake Wakatipu we arrived at the trail head of the Greenstone-Caples Track. Packing our backpacks full of food, tying our boots tight, and filling our hearts with love we stepped out onto the 67 km (about 40 mi) trek. Our team spent 5 nights and 6 days tramping through the Greenstone-Caples. We would camp outside of huts and fix delicious breakfasts and dinners for the other trampers and share life with them. Very much like our YWAM school, people had come from all over the world to backpack through New Zealand. We met many Germans, Brazilians, Kiwis (New Zealanders), Italians, Americans, Israelis, British, and a whole lot more. God opened up many opportunities to share His love. Though the trail was long at some points God always gave us energy to talk to people once we reached the huts. Here are a couple stories from our trek. I was super excited to go tramping into the bush. I had heard stores, all my life, of New Zealand's beauty from my parents and I was excited to see it first hand. I was also excited to get away from technology and meet new people. On our first day our hiking was slow. We had packed enough food not only for us but for any one else we met. It took us a little bit longer to get to the Mid Caples Hut, where all of us were happy to get out packs off. We set up our tents quickly, and I sat outside the cabin were a few of us talked to an Israeli couple. The couple were on their honeymoon and they shared some Arabic coffee with Mallory and myself. I am not much for coffee, but I enjoyed trying their brew. To be honest, I would rather have their coffee again than Starbucks. After a bit, I sat inside and talked with a young German lady named Kerstin. She was sweet and kind. We talked about Germany for some time, and I told her I had a desire to learn German. She was puzzled why, but we became fast friends. Before long, she offered to have me stay in Germany with her. I plan to take her up on that if I am ever blessed to be back in Germany. In the morning we offered her bacon and eggs before she started out again. I like making new friends, and after the trip we have sent emails back and forth whenever we have had internet. I have realized that sharing God's love is not a short process and above all it should be done in love and not forced. Also that each opportunity looks different. and it takes wisdom to learn how to discern for each person. We are all learning on this. who says to Zion, "Your God reigns." A couple days ago when we descended down the Greenstone Valley to the parking lot after five nights on the trail, our feet were not beautiful - at least not in any literal sense. Some of us had blisters, one of us had a toenail coming off, and all of our feet were pretty smelly after more than 65 km (40 mi) of walking. But while my body was weary and dirty, my spirit felt invigorated. Our six days trekking around the Greenstone and Caples Valleys west of Queenstown were a physical challenge and a major learning experience as we discovered what it looks like to share God's love and the good news about Jesus with each person we encountered on the way. In many cases, this just meant offering a passing smile and a bright greeting. In other cases, it looked like sharing some of the food that we had carried with us - including some special things you rarely get on the trail, like bacon or pancakes. Most often, though, we just had conversations with people. These would start out as small talk, but often it was easy to go a little deeper, listen to people's stories, and begin a friendship in a really short amount of time. In this way, we connected with a Brazilian family, three different Israeli couples, several Germans, a few Australians, a group of kiwi high-schoolers, an Italian woman, a French guy, and even a recent college graduate from Raleigh, NC - not to mention quite a few others. After initially being a little bit hesitant to begin talking to these perfect strangers, we quickly found out that it's really easy and our confidence grew. Many of these conversations stayed light and never got to the point of talking about God. We've found that it's not very helpful to force that; instead, we just listen, share our own stories, and stay alert for opportunities to go deeper and talk about spiritual things. It can be frustrating at times because I have recently gained a deeper desire for everyone we meet to know Jesus and have a relationship with Him. But forcing the gospel on someone who isn't ready to receive it (especially if they have been hurt by Christians in the past) can really do more harm than good. So we are happy to simply be a link in the chain of events that will bring a person to God and to pray for everyone that we meet, starting even before we meet them. The outside of the Greenstone Hut. We camped in a grassy area behind the hut on our final night out. On our fourth day out we met an awesome little group of four kiwi high-schoolers hiking with two of their dads. Through conversations, sharing some food back and forth, and a couple games of Farkle (a fun dice game) we quickly struck up a friendship. We soon found out that they were hiking the same way as us, so that we'd be able to hang out with them two nights in a row! For a long time our conversations with them stayed pretty surface-level, but we soon learned that one of the dads, Mark, was a Christian, and his daughter Hannah went to church as well. The other three students, like most young people in Wanaka, didn't go to church and had only indirectly seen or heard about Christianity. As we continued deeper into conversation, however, we found that they really were curious and interested to hear about why we followed Jesus and what it was all about for us. As they asked questions, a few of us were able to share our stories of relationship with this personal and immediately relevant God, One who speaks directly to us, cares about our lives, and loves us unconditionally rather than condemning us. It was incredibly fun to be able to share this passion that we have, even if they didn't become Christians on the spot or anything like that. God's activity was SO evident in our "coincidental" meeting of these young people, our interactions with them, and even our praying afterwards. As it turned out, we had already planned to spend a couple days after our hike in their hometown of Wanaka. This meant that we were able to see three of them again and watch a movie together at the local cinema!